Documentation: Photograph: 17 May 2015 Oliver Reservoir, Kimball Co (Brogie 2016). 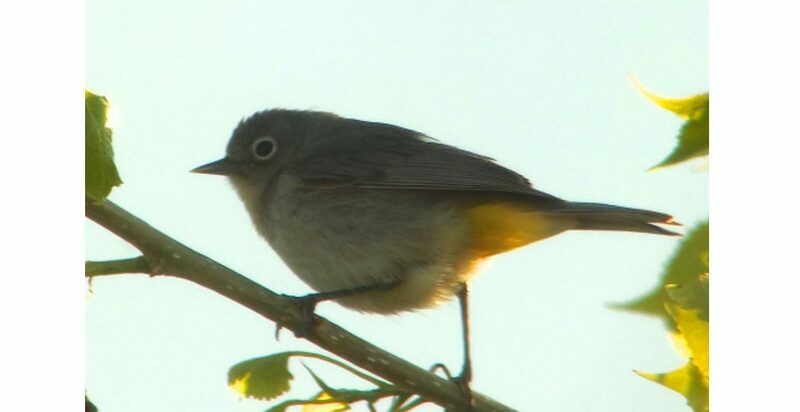 It has been suggested that this species and Nashville Warbler are conspecific (Phillips et al 1964), or at least comprise a superspecies (Mengel 1964). 4 Jun 2005 Wind Springs Ranch, Sioux Co, female (Silcock 2005). Additional reports follow. An experienced observer was reasonably confident in the identification of a male briefly observed 2 May 2015 in Dundy Co. A report of one at Oliver Reservoir 21 May 2016 was not accepted by NOURC as “lacking in detail” (Brogie 2017). Additional reports are of more than one bird first seen at the North Platte Fish Hatchery, Lincoln Co 26 April 1964 and again on 29 April by several observers, including at least one experienced observer familiar with the species (Gates 1964). There is an old report without observation date or other details of one seen by Aughey along the Republican River in Hitchcock Co (Bruner et al 1904); Sharpe (1993) questioned whether Aughey had ever visited this site. 4 Sep 2002 immature or adult female Oliver Reservoir (Silcock 2002). Comments: Status and possible sources for Nebraska Virginia’s Warblers were discussed by Dinsmore and Fontaine (2000). This species breeds in the Rocky Mountains north to southern and southeastern Wyoming, where the nearest breeding to Nebraska is in the Laramie Mountains and along the North Platte River to Natrona Co (Faulkner 2010). It is fairly common in Colorado, breeding in eastern foothills (Andrews and Righter 1992). It has recently been discovered breeding in the Black Hills of South Dakota (Tallman et al 2002, Drilling et al 2018), and it is a rare transient in southwest Kansas, vagrant elsewhere in the state (Thompson et al 2011). Photograph (top) of a Virginia’s Warbler in Kimball Co 17 May 2015 by Paul Dunbar. Dinsmore, S.J., and J. Fontaine. 2000. Virginia’s Warblers in Kimball County. NBR 68: 137-139. Mengel, R.M. 1964. The probable history of species formation in some northern wood warblers (Parulidae). Living Bird 3: 9-43. Phillips, A.C., J.T. Marshall, Jr., and G.B. Monson. 1964. The Birds of Arizona. University of Arizona Press, Tuscon, Arizona, USA. Silcock. W.R. 2005. Summer Field Report, June-July 2005. NBR 73: 94-113.